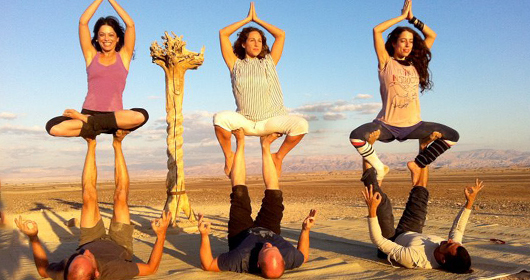 Israel will be at the epicentre of the Yoga world for at least a weekend in November as Yoga comes to the Arava Desert as it hosts the fifth Yoga Arava Festival from 6th to 8th November 2014. For one weekend, over 200 kilometres of the Arava will utilise the best teachers from various communities and from around the world stretching from Moshav Idan in the north, to Kibbutz Elifaz in the south using the ancient scenery to create a wonderful place for practising and improving your yoga. 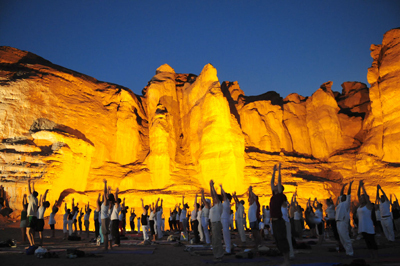 The main event will take place on the Friday evening with a sunset yoga session accompanied by live soothing music at the foot of Solomon’s Pillars in Timna National Park by Yogini Kaliji, with Tri-Yoga and yoga flow. The are many styles of yoga available to participants to try including Iyengar, Vinyasa, Ashtanga, Vijnana, Shivananda, Vinny Yoga, Anusara, Dharma Yoga, Kundalini Yoga, Power Yoga, Yoga and the Ayurveda feminine, funky Yoga and Acro Yoga. The practice focuses on the triple flow of: Yoga-Asana (posture), Pranayama (breath), and mudra(gesture). In the natural hidden qualities of steps with a unique rhythm, the calming exercises and wave-like movements, Tri-Yoga unites Pranayama and mudra with dynamic asana.Tri-Yoga is presented as a flow of four seasons: spring for awakening, summer for reinforcement, autumn for expansion, and winter for change.